While our tastes for cocktails tend to run to more simple drinks like an Old Fashioned or a Gin & Tonic, not including a cocktail made with candy canes in our list of 12 holiday drinks would seem incomplete. The candy cane first appeared in mid-17th century in Europe. Candy sticks were produced by confectioners in a time-intensive process of pulling, twisted and cutting the sugar sticks completely by hand. The cane shape is said to have originated by a choirmaster at Cologne Cathedral in Germany, who bent the straight candy sticks into canes representing a shepherd’s hook and handed them out to children at church services. 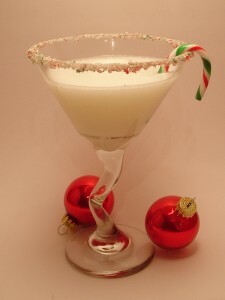 This cocktail features a rim of crushed candy canes and a delicious combination of peppermint schnapps and creme de cacao. Crush a candy cane into a fine dust. Wet the rim of the glass with peppermint schnapps, drip it into the crushed candy cane dust and place in the freezer to chill. Combine the peppermint schnapps, vodka, creme de cacao and light cream in a cocktail shaker half-filled with ice. Shake a few times and strain into the chilled cocktail glass. Garnish with a candy cane and serve.